On the outskirts of town, a mysterious quartet of strange men appear from thin air, on a mission to rescue a friend who has been kidnapped by Darkseid. In Metropolis, Clark Kent receives a series of photographs depicting these odd visitors. Curiosity piqued by what appears to be a city hovering at the end of a mysterious tube, Superman goes to meet the four visitors. However, all is not well, and the villainous influence of Darkseid makes itself known in the form of members of Intergang, who attack Superman. 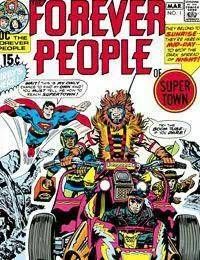 Defeating them, Superman joins with the Forever People to rescue their friend and stymie the machinations of Darkseid for another day.